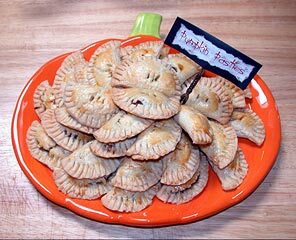 These pasties have a spicy pumpkin filling inside. Make them for Halloween and watch them disappear. Preheat oven to 425F (220C) degrees. Bake the pie filling only (no crust) in a large greased casserole dish in hot oven (425F) for 15 minutes. Keep oven door closed and reduce temperature to moderate (350C degrees F/180 C) and continue baking for 45 minutes or until table knife inserted in center of dish comes out clean. Cool on wire rack. Make or purchase pie crust pastry. Roll thin and cut into circles approximately 4" in diameter. Put a spoonful of the cool pumpkin mixture towards one side of the center of the circle. Fold over the crust into a half-circle and firmly crimp the edges closed. Slice three small slits in the top for venting, place on a greased cookie sheet, and bake only until crust is a light golden-brown.